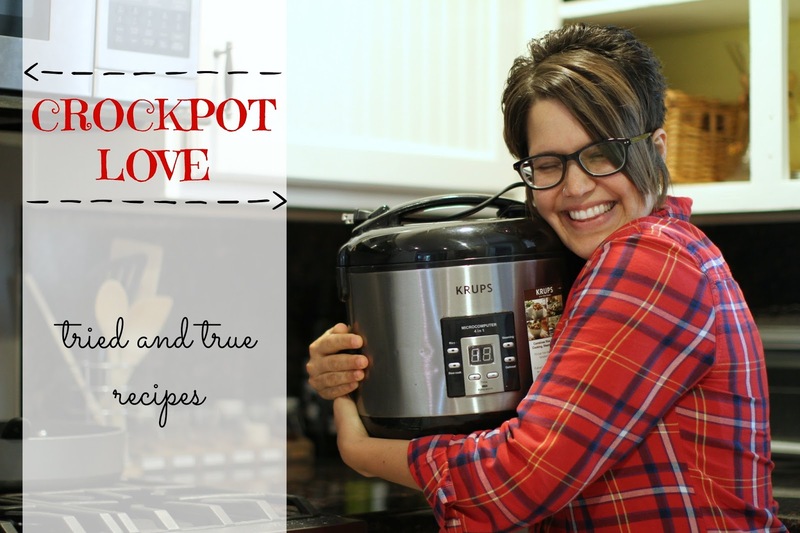 I feel like I need to get it out there that the runner up to this photo was one of me actually kissing my crockpot. Yes, I do love it THAT MUCH. I have been on the crockpot bandwagon way before it was even cool. Yes, it is cool. A couple weeks ago, I was reading the news and in the article, some big time chef dissed the crockpot. I instantly felt defensive. And may have even considered writing this lady a letter. I mean, she hadn't just dissed an acquaintance of mine, but a super close and super reliable family member of mine. Since I knew a letter would be no help, except to maybe give her a laugh in her day, I thought I would instead share some of my favorite go-to crockpot recipes. I try new crockpot recipes almost weekly. Pinterest is my go to source for recipes. The problem is, it is hard to find ones that are at least semi healthy, don't require a ton of extra work (so are more one pot style meals) and aren't soups. There are a couple soups on this list, but all these recipes are meals I have made numerous times and are winners in my house. Honey Garlic Chicken and Veggies - Bonus points for this being a "one pot" recipe because the veggies are already in it! Spaghetti Squash and Meatballs - In full disclosure, I use pre-made meatballs, making it literally "stupid easy" (see the name of the actual recipe on the link to get that one). Sausage Spinach Tomato Soup - So incredibly much flavor. And given how much spinach that goes in, I consider it a one pot recipe as well. Bonus points for this being a soup my husband actually loves…I'm the soup lover in the family, not him. White Chicken Chili - It only has five ingredients. It really can't get any easier. Teriyaki Chicken - This one may take a couple extra steps to make the sauce thicken at the end, but it tastes really good. One of my ultimate favorites, I don't have a recipe for, Rootbeer Pulled Pork. You literally just throw in the pork roast, completely cover it with rootbeer (I have had better results having the pork roast completely submerged vs. using a specific amount) and cook it all day. At the end of the day, pull the roast out and shred it. Then add some rootbeer from the crockpot and come bbq sauce and mix it all together with the pulled pork. It is so dang good. Wow, I really proved that big time chef wrong there, didn't I?! But seriously, the crockpot is one of the most used items in my kitchen. And I am loving life come dinner time when all the work is already done and we just get to eat. So I think it and I will be best buds for a long time.